Purchased at 6 months old is our foundation Angus cow. 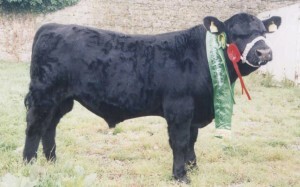 Winner of 26 Breed Championships and five interbreed Championships and also bred some tremendous males and females. Sire. Doonally GV Jumbo Dam. Laheens Martina. Sold to Richard F. Gibson for then record price of 4,100 gns at the April sales in Carrick-On-Shannon 1993. Winner of 36 Breed Championships and 11 Interbreed Championships. 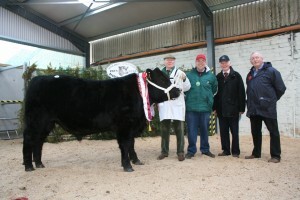 Sold for the record price at the time for an Angus Heifer £6,000 (€7,620) to Mr. Richard Cruise, Co. Mayo. 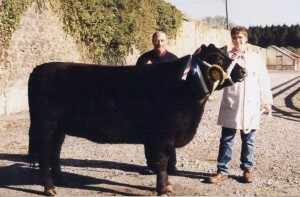 Supreme Angus Champion at the RDS Livestock Show 2002. 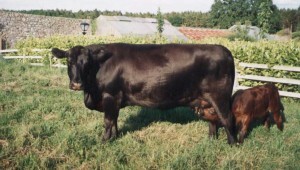 She has won several Angus Breed Championships and inter-breed championships. 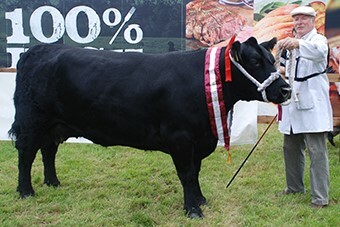 Regarded by most Angus judges as having the best female Angus Head in the Angus breed. Purchased from the late Josie Mc Donagh as a yearling. 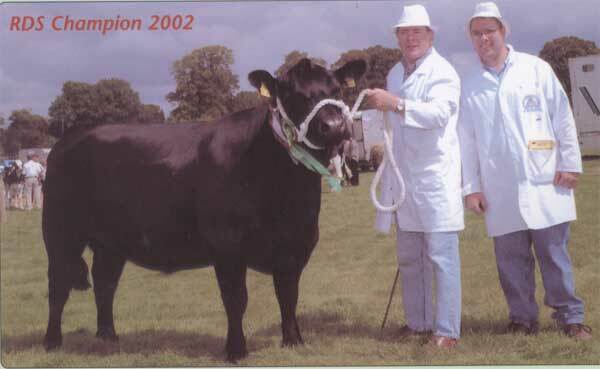 She has turned out to be a great show cow and was first in the Senior Cow class with calf at foot at the National Livestock Show in Tullamore in 2006. She is breeding well to Bohey Jasper. Purchased from Paddy Regan as a yearling in Carrick-On-Shannon for £3,600 (€4,572) April 1997. “Give us a cow by Tivanagh Baron and we will produce a champion”. Purchased after a trip to Perth Bull Sales in October 2006 while visiting the farm of Robert Galloway for £10,000. Black Star did a very good job and left some very nice females including our present show cow Moydrum Frauline Star winner of multiple Angus Breed Championships. 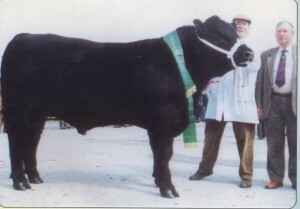 All Ireland Super Angus Bull Calf at the National Livestock Show in Tullamore 2000. 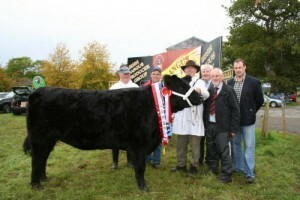 All Ireland Junior Irish Angus Bull Calf 2000. Sold privately to a suckler farmer. 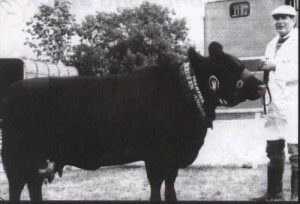 This bull was first prize winner as a calf at numerous shows and went on to develop into a magnificent bull with great bone, top line and back end. Sold privately to Richard & Mary Smith Cork as Stock Bull. 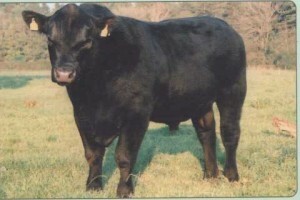 Samson was the sire of the top performance Angus Bull at the Tully Bull Testing Stud and sold for €8,000 to Dovea A.I. Station. Another great Angus bull from the Jubiter / Mighty cocktail and has left two whopping bull calves born in September 2006 to Moydrum Unique and Tonroe Rosemary. 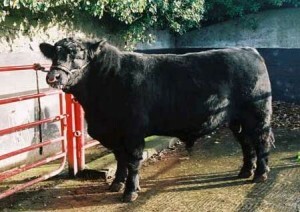 Sold at the February Sale in Carrick-On-Shannon ’06 for €3,500 to a suckler farmer in Co. Louth. Junior Male Champion R.D.S. 1991. Male Champion Cork 1992 & 1993. 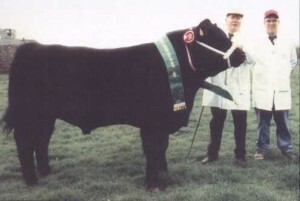 All Ireland Angus Male Champion Mohill 1993. 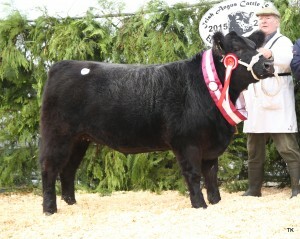 Top price Carrick-On-Shannon Sales 1991 sold to Sean Browne, Mayo for £2,200. (€2,794) Moydrum Pavorotti & Moydrum Lord Humphrey winners of the Cullen Trophy for the best pair of bulls bred by exhibitor Carrick sales 1991.